We held our latest meeting on 16th September at the Golden Lion. The publicity banner, now retrieved from Monmouthshire County Council’s depot and lovingly repaired, can again be displayed (once permission is granted) but we will need to get public liability insurance first. So hopefully it will be on show again soon. Despite intensive efforts in parliament by our very supportive MP, Jessica Morden, we still don’t have a definitive answer on whether the ‘relief lines’ will be electrified (which is critical to having our station). Jessica will now write directly to Network Rail to try and get an answer. We have secured an ‘external representative’ position on Monmouthshire County Council’s Strategic Transport Group. This is very useful as we can help to influence the way local transport policies and plans are developed. At its next meeting, later this month, a representative from Network Rail is to be in attendance – hopefully a chance for us to ask the ‘relief line question’ again! We agreed that we would make a gentle start on the ‘Crowd Funding’ process to raise the necessary money for the GRIP feasibility process, even though we don’t have the answer to the critical electrification question yet. 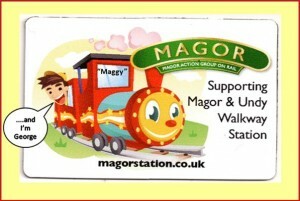 We will be carrying out a simple ‘awareness survey’ (in Magor and Undy) at the end of the month. This will help us gauge more precisely the level of support we have for the proposed station and what the current and future use of rail transport is and might be in this locality. The Group decided that it would have a stall at the next Frost Fayre as it’s a great opportunity to get more people on board and sell some more of our popular, limited edition, fridge magnets.